Free plans for Halloween yard decorations will add to the spooky season and are easily built using basic tools. Zombies, coffins, tombstones are a few. 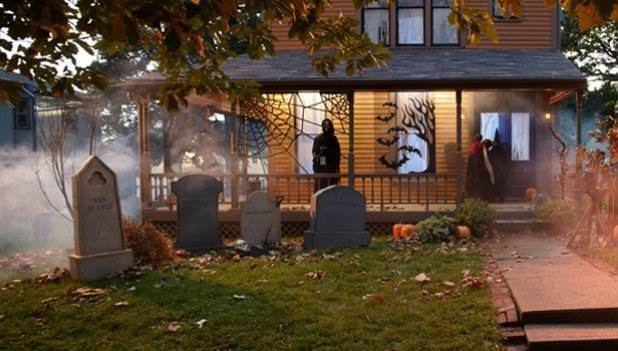 Make one of the Halloween yard decorations below with free plans and it will last for many Halloweens. These plans will show you what you need to make the yard decorations and how to put it all together. Get ready now for Halloween! Click here for Halloween Crafts. Take a 2 x 2 piece of plywood and turn it into this scary lawn rat using this detailed woodworking plan. 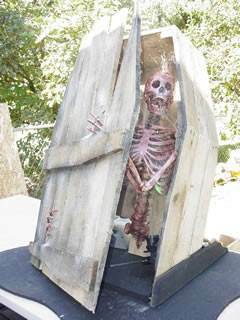 Build a wooden coffin that appears to be coming out of the ground and has a scary skeleton inside. This downloadable plan will help you build zombies to place on your front yard this Halloween season. 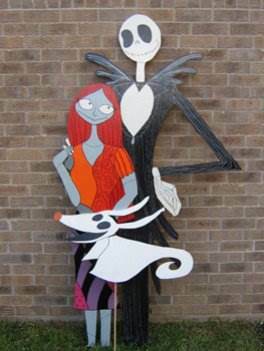 Use a jigsaw, paint and some plywood to create Zero, Sally and Jack for your own Halloween lawn art. 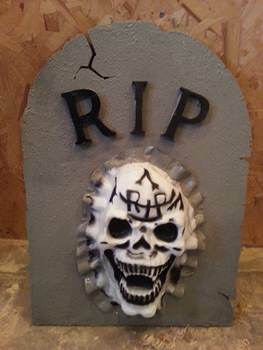 Make this cool looking tombstone out of MDF and glue on a scary skull purchased at a dollar store. 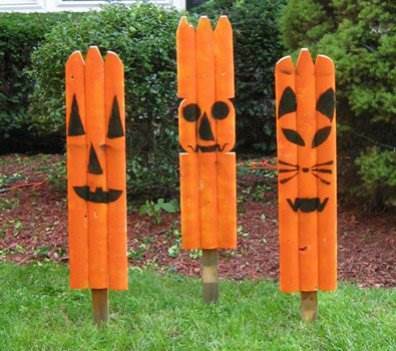 These fine fellows are made out of an old wooden fence then painted orange and given a pumpkin face. 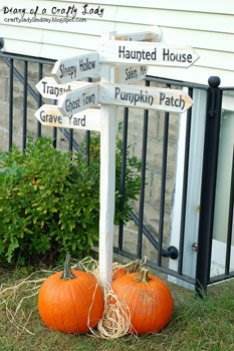 Get the kids involved in making a sign post that points the way to a Haunted House, Sleepy Hollow and other landmarks. 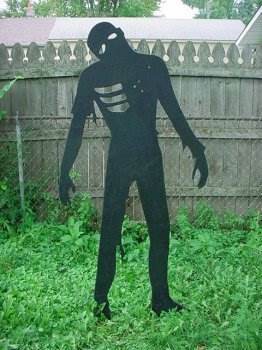 Scare all the trick-or-treaters with these lawn zombies that are cut from plywood with a miter saw. Turn your lawn into a eerie grave yard this Halloween by using this simple plan for building one or several tombstones. Follow the instructions to create a cool skeleton that seems to be rising from beneath the ground. Here is a plan for making owls out of treated plywood that are designed to sit on a porch banister. Give trick-or-treaters a fright with this spooky black cat with a raised back made using this easy to follow tutorial. Follow this detailed plan with step by step pictures for creating one or more tombstones for a scary front-yard graveyard. 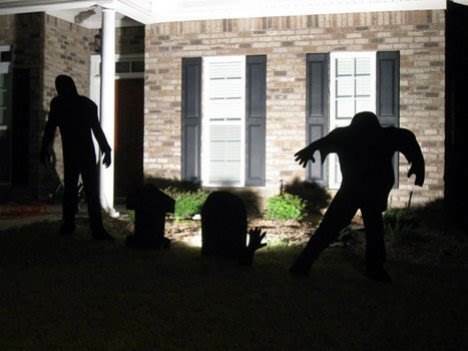 Have fun building a front yard cemetery that kids and adults will love being frightened off this Halloween. This scary ghost has risen from the grave and is built out of plywood and then painted. This is a fun Halloween yard accent all the kids will love. Halloween is all about the jack-o-lantern. Here are two smiling jack-o-lanterns that you can create using this plan. 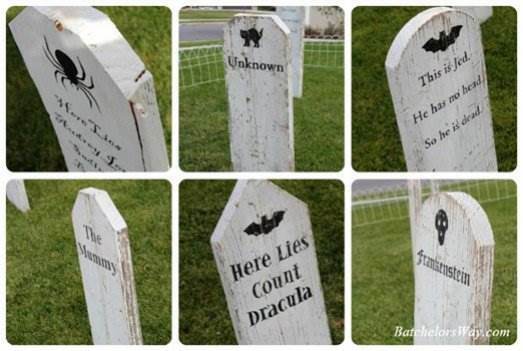 Halloween tombstones can be made using several different mediums. To make a tombstone out of wood, use a jigsaw and cut the wood into the shape of a rounded tombstone. Paint the tombsones black or gray. Use white or black paint to write funny sayings about your family on the tombstones. To insert the tombstones in the ground, screw some long screws into the bottom of the tombstone, leaving a large section of the screw sticking out. Then the tombstone be can pushed into the ground. Or add another piece of wood at right angles to your tombstone to hold it up. Cover up the additional piece of wood using one of the methods below. Create a graveyard with your tombstones. Put a mound of dirt in front of the tombstone to look like a fresh grave. Some mulch spread out over a large black trash bag will provide a nice musty smell, besides covering up your extra board. So that everyone can see the graveyard, add a few lights to highlight your cemetary. Add a directional light fixture (with a blue light) 8 to 12 inches from the front of the tombstone. Cover the back of the light fixture with aluminum foil so it won't reflect back on the viewers.Spray paint this foil brown and cover it with mulch to hide the lighting component. Add dead flowers, spiders, fake bloody hands and other creepy items to the gravesite.Spread spider webs around the tombstones. Dead flowers can make your graveyard special, so keep an eye out for flowers that have withered and died. Dead flowers will give your graveyard the credibillity it deserves.